Archbold’s Kaiden Bedsole leads off the first inning with a single against Tinora in the ACME sectional on Thursday. The Blue Streaks have advanced to the district tournament as they were sectional runners-up to Ayersville. Archbold’s Derek Walker, left, puts a tag on Reid Anders of Tinora in Thursday’s ACME contest. Bryce Williams lays down a bunt for Archbold in their game with Tinora. ARCHBOLD – The 2015 Archbold Blue Streaks ACME baseball team came into the sectional tournament with a near unblemished win/loss mark of 14-1, a record built on dominant pitching, exceptional defense and solid hitting. On Thursday night at Archbold’s Memorial Park, they applied all these phases of their game to methodically defeat the visiting Tinora Rams, 5-0, in the opening tournament contest. The Blue Streak victory was powered, in part, by the Petersen battery with Sam Petersen on the mound and twin brother Gabe behind the plate. The Rams went down in order in the top of the first but only after Sam hit Reid Anders with a pitch to lead off the game, then watched brother Gabe gun down Anders attempting to steal. Archbold, on the other hand, wasted little time in getting on the scoreboard against Tinora starter Tyler Giesige, a hard throwing right hander with an unorthodox leg kick that brought his left foot about two feet above his head before he delivered the pitch. It seemed to have little effect on the Streak hitters. Kaiden Bedsole singled to right to start the bottom of the first, took second on a wild pitch and third on a stolen base. Toby Walker flew out to left but Ben Bucklew lined a pitch into left to bring home Bedsole with the game’s first run. Three Ram errors allowed another run to score and a single by Isaac Petersen plated another as the Streaks led 3-0 after one inning. In the top of the fourth the Rams finally got to Petersen with lead off singles by Anders and Giesige, but Sam quickly shut the door with back-to-back strikeouts and a fielder’s choice to escape the threat. The Streaks had a great chance to blow the game open in the bottom of the fourth when they loaded the bases with no one out and had the number three, four and five hitters coming up but Giesige worked his way out of it with a fielder’s choice, a pop fly and a line drive to the second baseman. As it turned out, the squandered opportunity proved to be of little consequence as Petersen only allowed two more hits and no runs over the last three innings for the complete game victory. Giesige took the loss for the Rams as he gave up five runs, one earned, on six hits. Bedsole paced the Blue Streak offense with two hits, a sacrifice bunt and a run scored. 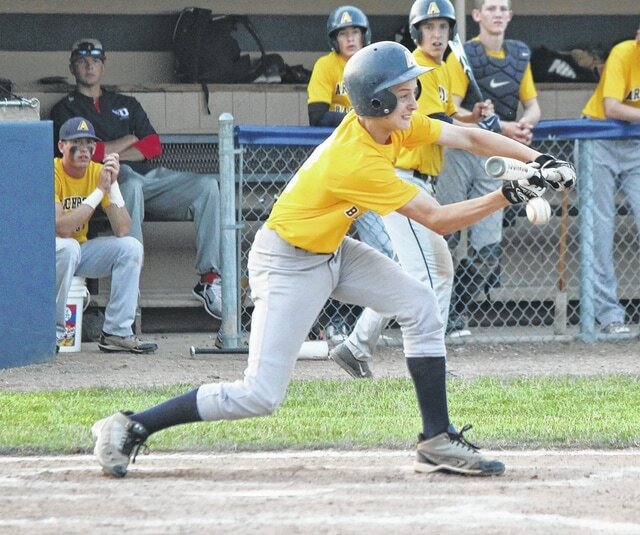 Archbold fell to Ayersville, 15-3, on Friday to fall into the consolation bracket. The Streaks then defeated Tinora, 13-3, in the finals of the consolation bracket on Sunday but were again bested by Ayersville in the sectional final. Both the Streaks and the Pilots have advanced to the ACME district tournament at Patrick Henry beginning this Saturday.